The key to becoming the best chef you can possibly be? Don’t eat out when you can eat in. The more you practice the art of cooking, the more aware you become of amazing flavor combinations, of preparation techniques and of cooking times. Get all three of those in alignment, add a lot of love into what you are creating, and you will help to inspire future generations of home cooks to eat healthier. See, eating wholesome food is not only good for you, it is beneficial for the world too. But enough about philosophy, let’s get to the ingredients. Salmon. It’s been done and done again. 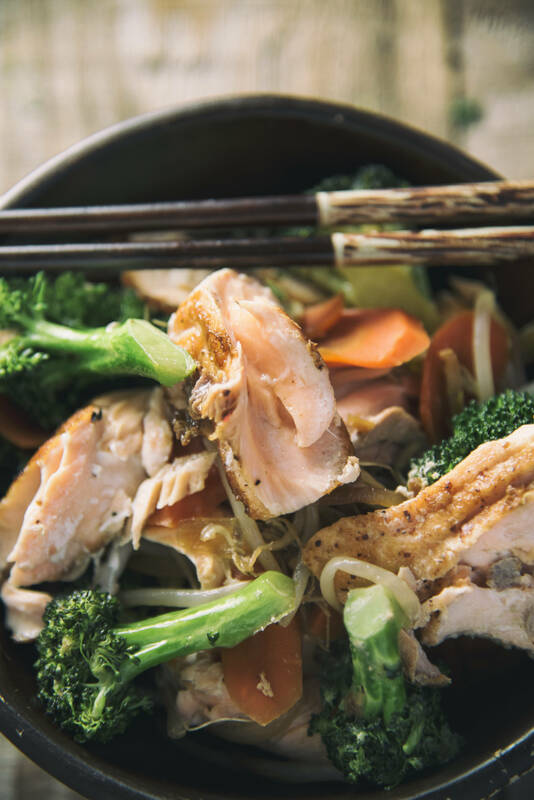 Yet in the spirit of creative dining, we’ve been trying new combinations of flavors and we know this teriyaki salmon is a true winner. The carrots, onion and broccoli are reminiscent of Western cuisine, but then we add in the minced ginger, coconut aminos and bean sprouts and suddenly we have created a worldly dish with flavors of both here and there. Whether you are using chop sticks or a fork, each bite is a divine mouthful. When you are ready to explore other Paleo teriyaki recipes, make a simple beef teriyaki become your first choice (you may want to keep it on meal rotation for several weeks! ), then when you are in the mood for poultry, let the teriyaki-style chicken wings make their way in. Once you’ve mastered those, invent your own teriyaki style. In a small bowl combine the coconut aminos, raw honey and red pepper flakes. Cook the salmon chunks for 3 to 4 minutes per side in the skillet, then remove from the pan. Add the onion, ginger and garlic, and cook 2 to 3 minutes while stirring. Add the broccoli and carrots; cook for another 4 to 5 minutes or until soft. Pour in the coconut aminos sauce and mix everything together. Bring the salmon back to the skillet, add the bean sprouts and gently toss everything.